recount to you the grace of God and show you how good he truly is. My freshman year of college at Auburn University the Lord radically shifted my life plans and called me into ministry. Previous passions died in a moment and over the next year I fell deeply in love with service of Jesus Christ and his church (a love that still remains). As such, I knew I had to get to ministry as soon as possible and as responsibly as possible. I learned that I could graduate college in only 3 years if I switched my degree to philosophy thereby saving me money and getting me to ministry sooner. I had a full tuition scholarship, but the less I spent on housing and living the better. I began to research seminaries nearly immediately after being called to ministry. I had a long list full of great schools: Trinity Evangelical, Beeson Divinity, The Southern Baptist Theological Seminary, Gordon-Conwell Theological Seminary, Reformed Theological Seminary, The Master’s Seminary, and on and on. All of these are exceptional institutions. Some were disqualified by distance from home alone (Master’s and Gordon-Conwell). After that, the choose became much more difficult. The greatest mentor in my life, Sam Hallman, was and currently is still getting his doctorate at Beeson Divinity School and talked it up to me. Beeson is a small, confessional institution in Birmingham, AL, which is all of 25 minutes from my hometown. As I was still researching, I listened to a sermon by Robert Smith, Jr. called “The Glory of the Groan“. It was then and is now the best sermon I have ever heard. I sat alone in my room and wept listening to it. As a Southern Baptist who believes there is no greater calling than to preach the Word of God, I knew this was it. I just knew it. Dr. Smith quickly became my hero and mentor from afar. I bought boxes of his sermons on CD and listened to them regularly. I downloaded as much of his stuff as I could find; articles, sermons, lectures– I had them all! 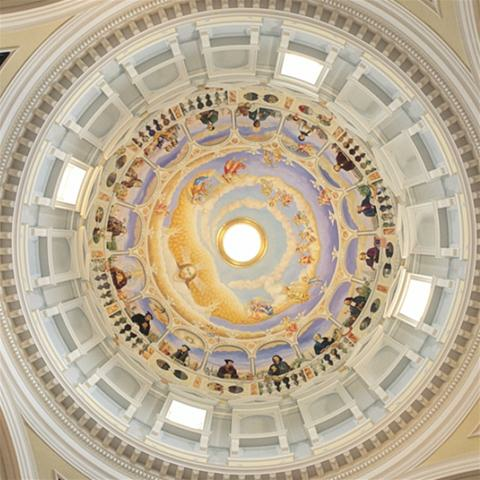 The dome of Beeson Divinity’s Hodges Chapel. My decision was made before my senior year. I was going to Beeson Divinity School. 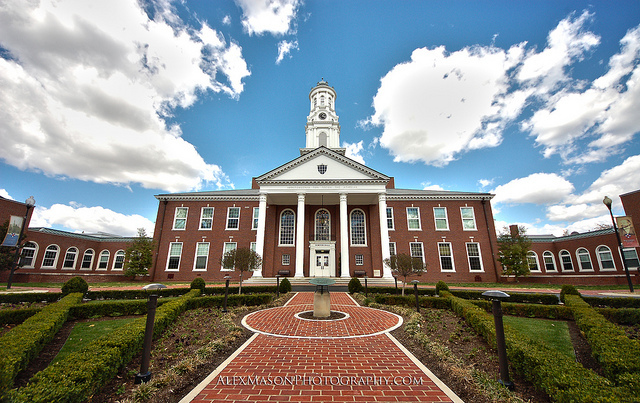 The school I had considered the most after Beeson was The Southern Baptist Theological Seminary. When I was called to ministry I had to deal with a lot of dissatisfaction towards the church (local) and Christian attempts at intellectualism. One of the most, if not the most, influential men on me during this year long process was Dr. R. Albert Mohler, President of the Southern Baptist Theological Seminary. He is nothing short of brilliant and played a large part of my realizing that church and Christian thought doesn’t have to be done in the way I had seen. To this day, I will never be able to thank him enough or repay him for the influence he had over me (though he has no idea, nor would he want repayment if he did know). As I looked at Southern Seminary, a bit of rebellion remained towards my Southern Baptist roots. An interdenominational school seemed, to me, far superior. I became a bit of an elitist about it. “Those Southern Baptists, you know. They’re all saying the same thing there. I want some diversity.” What a fool I was. Besides, they keep telling me that they have the best seminary in the world. Really? C’mon. All I could think about was Buddy the Elf’s response to the best coffee in the world sign. After all, SBTS has like 4,000 students. You’d think the best seminary in the world would be a little more exclusive. By the midpoint of my final year at Auburn University, my mind was set. I was moving to Birmingham after school to attend Beeson. One of my mentors in ministry, a friend of my father’s with whom I had a written correspondence, Calvin Miller, was a preaching professor there. My new found hero, Robert Smith, Jr. was there. My GPA was high. I was a three year graduate. My recommendations were superb. My interview was one of the most encouraging hours of my life (they were so excited that I wanted to be a preacher, not an academic). I visited multiple times. I worked 7 months on my admission essay on the Apostle’s Creed and, if I may, it was pretty darn good. I had had dinner with the Dean, who my pastor (who was discipling me) was friends with. Everything was perfect. Now I just had to wait. My dad called me on August 2nd. I told him to open it. I could hear him opening it on the other end of the phone. Then, silence. It seemed like my father had fallen in. That silence was the longest of my life. “Say it,” I told him. I hung up the phone and walked to my room. It was April! I was going to graduate in a month. I dropped (not sat or lay, but dropped like a rock) to the floor of my room. I wept openly. Door locked, I was free to express my rage. Why God?! Why have you robbed me of this?! I did everything right, do your job!! Then I cried. I had no other response. I simply wept. For the first time in my life, I had been rejected and in the most important area of my earthly life. For nearly two years, I was set on this. I had it all planned out. Now, this. I rolled over on the floor of my room and grabbed my laptop. I was desperate. I went to Southern Seminary’s website and logged in to the admission application I had finished. I clicked “submit” and paid my application fee. At least I had a backup plan. I called Beeson for a reason for my rejection. They had none. The lady on the other end of the phone had worked with me quite a bit throughout the application process. She seemed shocked herself I had not gotten in. She dealt with me graciously and plead with me to reapply for the spring. That’s what I would do, I thought. I was going to Beeson no matter what. I had plans, after all. Beeson is a marvelous school. I have good friends there and would never speak ill of it. The fact is, Beeson was my plan. As I was about to find out, God had plans as well. His plans were better than mine. His plans would change me. His plans would change everything. How he put his plan in motion, however, is the greatest story of providence in my life and the subject of the post to follow.